Mr. Alexander Andries Maramis (born in Manado, North Sulawesi, the Dutch East Indies in 1897 - died in Indonesia in 1977; aged 79/80 years old) is a member KNIP, BPUPKI members and the first Finance Minister of the Republic of Indonesia and is the person who signed Oeang Republic of Indonesia in , 1945. Younger brother of Maria Walanda this Maramis graduated in law in 1924 in the Netherlands. 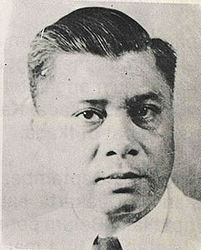 At the time of the Dutch Military Aggression II, AA Maramis in New Delhi, India and was assigned to lead the Indonesian Government in exile. He later became Minister of Foreign Affairs in the Cabinet chaired by the Emergency Sjafruddin Prawiranegara. When it was born in 1897, no one dared to suspect that the child would become a respected and loved figures. Silently he grew up in grew up in the middle of farm families who happen to have the economic capacity above the average farmer Minahasa that era. He obtained treatment affection of both parents. So it is with his brother.After considerable age and he schooled as children in general. While studying at ELS which is taught in Dutch, her mother died. He is greatly saddened by the death of her beloved mother. His father later remarried. Jakarta has teersendiri meaning for him, in addition to Manado. There he had to stay and hang out in the family home the Netherlands, in addition to their studies and binding friendships with his fellow students at HBS. He began to understand why he had to learn the language and culture of the Netherlands.Practical utility of the Dutch language and culture and nationality of the new insights and begin institutionalized, had forged his soul Maramis Alex was growing up. After graduating from HBS, then three with Soubardjo and Datuk Ahmad Pamanjuntak of West Sumatra, they went to the Netherlands to study. But in the Netherlands the situation is different in Jakarta, especially Manado. They breathe the air of freedom in Europe they had never experienced in Indonesia. The students we started moving towards unity Diman Maramis Alex was in the middle of the stream is flooding it. Indische Vereninging they form since 1908 in exchange for mutual consent to the Indonesian Association. Pride of Indonesian identity has germinated and began to master his own thinking.As a legal scholar, Alex Maramis returned to Indonesia in 1924. Actually it can work for colonial interests, it does not dilakukukannya tetapa. The only way adalh worked as an Advocate and solicitor in which he can directly hear the complaints of the oppressed people., As did his father. But the past has made Alex Maramis ready to love and be loved a young widow of Dutch descent: Elizabet Marei Veldhoedt Diena. Kedunya agreed to get married in 1928, two years after Alex Maramis moved to Palembang. Now he has a stepson who dibwaw entered her into their family environment. As an early sign of love for the child, he named Lexy Maramis.In line with its membership in the Association of Indonesia, then when PNI in shape in 1927, he become a member. When the party leaders were arrested everywhere, he was in Palembang and avoid the colonial government's actions at that time. Since I was in the Netherlands, he had said to my comrades in arms preformance Association of Indonesia that the struggle is not only a struggle mature and clear goals. On the other hand, the fight takes too readiness funds to support the fight itself, which was not done by PNI. This is evident with the appointment of Alex Maramis in three tenure as Finance Minister revolution Diman future national struggle desperately need financial support. At that time, he co-founded and led KRIS and opium smuggling gold out of the country after successfully penetrate enemy blikade.In some situations a critical and decisive, he looks forward. He signed the Jakarta Charter. As finance minister, he took over as Prime Minister and Minister of Foreign Affairs in order to function PDRI continue the struggle at that time. Honesty and the results of the struggle submarines serving finance minister, in complete bitterness that kecapnya. Among others as Special Ambassador with full power to examine the financial administration and personnel and representatives of Indonesia abroad. Position as RTC Advisory Delegates to the talks in the Netherlands. Aknirnya the ambassador in various countries. To all positions that require a high devotion and great soul of a leader like Alex Maramis this.During that time, he remains a beloved husband in, a stepfather who are wise, and a family member Maramis most enjoyable. Full of self-discipline, honesty in nerbagai position, a clever diplomat and knows national pride. Fitting it when people vote "Lonely Pmrih Ing, Ing Rame Make". He never demanded services or mengih promise. Alex Maramis, a character who has held various positions of ministers and ambassadors, dozens of years hidupmiskin his family, away from the homeland. And in 1977, he went on pianggil presence of Almighty God. Perfected already presence in this world.